Comment: “The wolf shall live with the lamb, the leopard shall lie down with the kid, the calf and the lion and the fatling together…” The Mitten is an Ukranian Folk Tale that describes the experience a wide variety of woodland animals sharing a lost mitten for warmth. Brett’s illustration of a variety of animals sharing a tight space without harming one another pairs nicely with Isaiah’s description of God’s holy mountain. Sadly, the mitten has limits and eventually is unable to hold all the animals. This leads to an interesting reflection: How is the mitten like God’s holy mountain? How is it different? Comment: “May the God of steadfastness and encouragement grant you to live in harmony with one another…” Paul’s text is as relevant for our communities as it was for the Romans. People have a hard time living together in harmony; life happens and often makes us wary and distrustful of others. This was the way it was for the villagers in Stone Soup. Though they shared a village, they did not share lives. 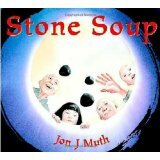 Through the act of making stone soup, the villagers learn of the richness and joy that comes from sharing our resources and our lives. Something similar happens to us when we gather to share communion. In the breaking of the bread and the sharing of the cup, we are invited to lay aside fear, anger, and prejudice so that we might see Christ within our neighbors. In many ways, this is the experience of welcome and harmony described by Paul. Like the villagers, we find richness and joy in this shared meal, by the power of the Holy Spirit. Comment: “Prepare the way of the Lord…” When we meet John the Baptist, he is preparing people for the coming of Christ through baptism. This text brings to mind the Advent themes of anticipation and preparation. We spend the season anticipating the coming of Christ, and we prepare our homes and our hearts for that coming. In Mama’s Coming Home, father and sons clean the house and make dinner to prepare for Mama’s return home. 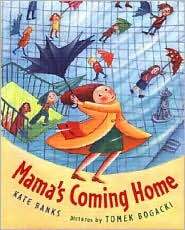 Children will connect with Advent themes through the association of the anticipation of and preparation for a caregiver’s daily return home. Lectionary Links: Sunday, December 5, 2010 by Storypath is licensed under a Creative Commons Attribution-NonCommercial 4.0 International License.